It means pulling your hair out if you have a kid who has to label all her Valentines for the class party. --some kids have names that make it hard to figure out if it is a boy or a girl. I called one person a boy, and Natalie was all, "That's RUDE! SHE'S a girl!" It made me flashback to the Courtney I went to school with. He was a boy. It always threw me off. --it takes forever to label 20+ Valentines, especially if your kid is like, "My hand is hurting," every two seconds. Followed by, "I need a break." --she's specific about WHAT Valentine each kid gets. I'd randomly hand one to her and she'd be like, "This says BE MINE. I can't say BE MINE to Cody. It'll give him the wrong idea. He chases me all the time and I'm not interested." I am NOT crafty. This sort of thing does NOT bring me any type of pleasure. The instructions confused me. It was all, "Use the foam glue to keep the paper in place." First of all, I had no idea what foam glue was. Nothing was labeled. I eventually found squares that were the foam glue. 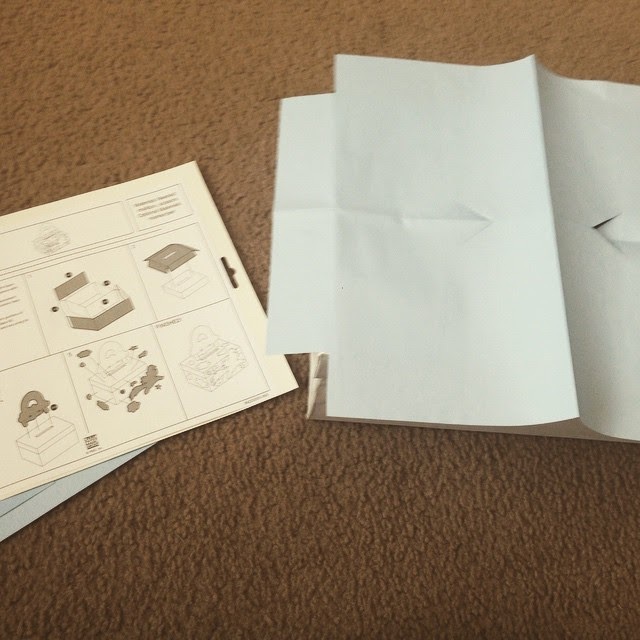 But the instructions didn't specify how many squares that were needed per piece of paper. So I used one, and the paper kept falling off, so I had to add MORE foam glue squares. Foam glue squares got stuck to my pants. My shirt. My hair. I HATE foam glue squares. I eventually figured it out. I mean, it's not perfect. The paper is falling off in some parts but I can't face the foam glue squares anymore. I let Natalie put the sticker bits on wherever she wanted. I was like, "We're done! No more Valentine's Day stuff!" and Natalie was like, "You have to bring something for the party. Maybe you can make a cake?" "I'll bring store bought sugar cookies and plastic cups. Deal?" This is my fear when I have kids. haha I would love to work on projects with them but man I find kids these days have SSOOOO many projects. Maybe because I went to all girls schools all the time I didnt notice, but I cant remember doing so much for valentines day! Aw, I'm glad you made it through. This is one of the types of things I look forward to most when I have kids... but there are lots of other things I dread. I use to be the mom that organized the class parties and made something from family fun magazine as the years have gone on, they are lucky I even know when the party is. Once again, I'm glad we've never had to make a dumb box. And I like craft stuff! I feel your pain. I have to do the cards with three kids now. At least my youngest doesn't have to label who they are for. Too crazy about the box! Oh boy, your name comment brought me back to my memories of my youngest son's first grade class. There was one girl who always liked to play with the boys rather than the girls, and my son was having a birthday party and I told him if he wanted to put invitations in cubbies so he could invite people whose parents I didn't know, he had to either invite all the boys or the entire class, which I believe was the school's rules. So he was doing his invitations with me, and he was just inviting the boys and he included her on the list. I said "she's a girl" and he just looked at me completely blankly. She was one of the boys to him, because she always played with them. We ended up inviting the whole class. LOL Anyway, I am thankful the days of Valentine's are over! Sorry, that was way off topic. And I haven't been here in a while...I fell so far behind over the holidays! Haha! So her box is super cute! It took us two days with long breaks to get ours filled out. I wish my 7 year old had done it in an hour! You two did great! I do not look forward to these evenings but it seemed like Natalie enjoyed most of it. I can't imagine what it's like with a kid who wants nothing to do with it. It's ok to show up with no box right? Isn't their book bag sufficient to hold the cards? Or a paper bag? WIN on the store bought cookies! We had brown paper bags and we decorated them in class. Back then, you weren't required to bring a Valentine for every child...and since I was the target of bullies, I didn't always get a Valentine from everyone. Lame. I can't wait to have a child and decorate stuff like this. You're lucky. Fingers crossed we will get pregnant soon. Weird because Scarlet hasn't said anything or brought anything home about it. Maybe I was supposed to read those papers she brought home?? Oops! Erica decorated a brown paper bag because she didn't want to put the effort in to decorating a whole box. Fine by me. I had to buy Jell-O for her class party. And we were not allowed to send in candy to accompany the cards. Which is absolute horseshit. Okay, that's one thing I don't miss about the elementary school days. My kids were always so particular about who got what valentine too. 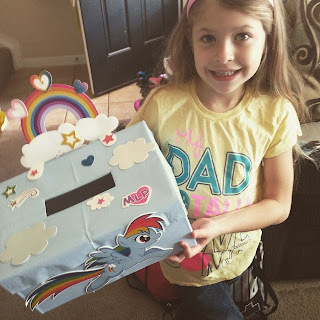 I think her Valentine box turned out cute! I keep asking Jayce if he is supposed to do valentine cards and he's like, "I don't know. I think so?" But he hasn't brought home the class list. WTF? Do 4th graders do them? Jaina went to an Intermediate school and the answer was no. Jayce goes to a different elementary school. I'm confused. It's totally ok to not do anything on Valentine's Day. Neither one of us is deployed & we're staying home because, 4 kids. :) I bet you miss him though, and that makes it harder. This year my seven-year-old hand made valentine cards for each of her classmates. 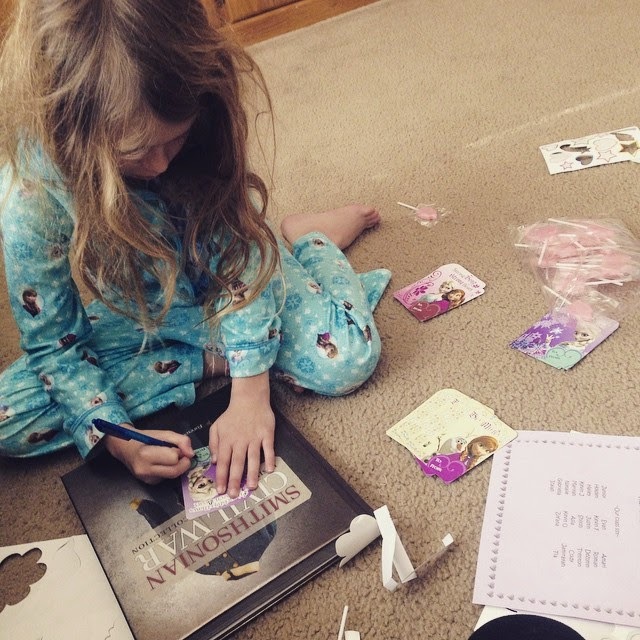 It was really sweet, but all I could see in my head was bedtime on Feb 13th when she'd invariably get nervous about not having the same store bought cards as everyone else and go into meltdown. I snuck out and bought some as a just in case, and sure enough they were needed. Disaster narrowly averted by letting her give out both (so two labelling sessions), but all stress.